Mölkky (Finnish: [ˈmølkːy]) is a Finnish throwing game that was created by the company Lahden Paikka – formerly known as Tuoterengas – in 1996. 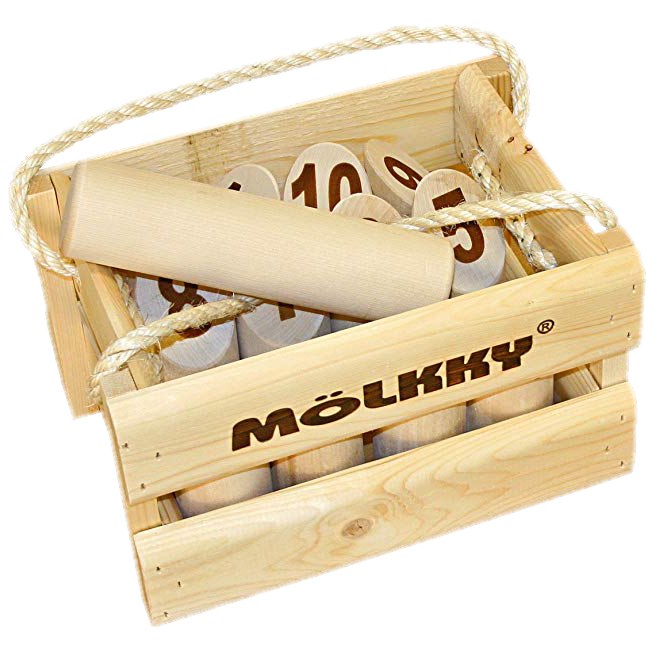 Given the exotic name of the game, Mölkky is commonly misspelled as molky, mollky, molkki or molki. The word mölkky was coined by its creators and has no actual meaning. It was probably inspired by the Finnish word pölkky, which means block of wood. Mölkky is a game that requires both skill and precision, but also a strategical mindset! Lahden Paikka has been manufacturing Mölkky since the 90's. The production of the game is eco‐friendly because the company uses excess wood from other projects. There are no nasty chemicals involved. Plus, the natural timber is sourced from 100% sustainable Finnish forests. In 2015, Mölkky actually won the Green Toy of the Year Award! Mölkky is based on a game that has been played for centuries, called Kyykkä – also know as Finnish or Karelian Skittles. It was originally played in Karelia, a region that covers parts of Russia and Finland. 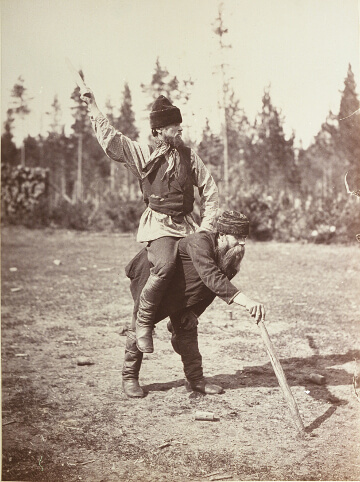 In the 20th century, a great number of Karelians migrated to Finland to escape civil war. And luckily, they brought Kyykkä with them! The rules of Kyykkä can vary quite a bit, but it basically goes like this: the players throw a karttus (a club resembling a baseball bat) at kyykkäs (small cylindrical skittles) to knock them out of their own game square. The team who needs the fewest throws wins. Traditionally, the winners would get to ride on the backs of the losing team! Mölkky is sort of a “light” version of Kyykkä. You’re not required to throw a huge and heavy karttus bat, so Mölkky is suitable for anyone. Even for the most serious couch potatoes. Today, Mölkky tournaments are played all over the world. There is also a Mölkky World Championship (with around 200 teams of 4 to 6 players participating) organized every year. Mölkky associations exist not only in Finland but also in many other countries such as Slovakia, Turkey and even Japan! Since 2006, the game has become a huge success in France in particular. France is now the leading country (before Finland) where Mölkky is sold and played the most. While some companies sell their own branded version of the game (such as Finska or Klop), the Mölkky trademark is now owned by the Finnish board game company Tactic Games. So yes, the global Mölkky force is strong. Passionate Mölkky players work hard to promote the game around the world. There's even a possibility to become “Mölkky Nobility”: that’s how the former Finnish International Mölkky Organization (FIMO) recognized people’s contributions to the cause. Wouldn’t it be nice to become a lord or lady of Mölkky? The players use a throwing pin (the Mölkky) to try to knock over wooden pins, which are marked with numbers from 1 to 12. Knocking over one pin scores the amount of points that is marked on the respective pin. Knocking over two or more pins scores the number of pins that were knocked over. After each throw, the pins are stood up again in the exact location where they landed. The first one to reach exactly 50 points wins the game. If a player scores more than 50 points, the player's score is set back to 25 points. A player that misses all of the target pins three times in a row is eliminated from the game. The World Cup, the Nations Trophy, the French Open and the Individual Masters. Year in year out, a great many Mölkky tournaments are played all over the globe. For professional players in associations, or laid-back players with no further aspirations. There are tournaments organized to suit everyone’s taste, so don’t be afraid to sign up for a tournament near you. From 1996 until 2015, the World Championships were organized every year in Lahti, Finland. Due to the growing popularity of Mölkky worldwide however, Finland is nowadays no longer guaranteed as the host for this magnificent tournament. Indeed, the 2016 World Championship was the first in the series that took place outside of Finland, namely in Rheu (near Rennes), France. In 2014, the 1st Indoor European Championship was held in Tallinn, Estonia. And just like the Davis Cup in tennis, there is also a Nations Trophy for Mölkky. Regardless of the global popularity of the game, Finland is still superior in this area. Mölkky is enormously popular in France, and therefore most of the tournament action is taking place over there. Open to all, and with more than 500 teams participating, the Open de France is the biggest yearly recurring tournament in France to date. Since 2013, a French Inter-Club championship is also being organized, where official Mölkky associations (on invitation) battle for honour and glory.